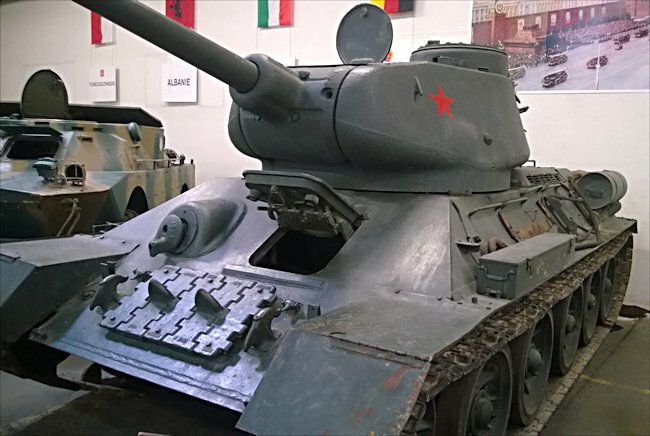 This T-34/85 Russian Soviet WW2 Medium Tank can be found at the French Tank Museum in Saumur in the Loire Valley. The Museum has three T-34/85 and one T-34/76 Red Army tanks. One of the Museums T-34/85 tanks arrived at AMX Satory, France in 1969. It had been captured from the Egyptian Army by the French in 1956 during the Suez Crisis in Egypt as part of Operation Mousquetaire. It was part of a batch produced between 1952 and 1958. The first T-34-85 tanks were produced in 1944. Although the more common way of showing this tanks designation is T34/85 or T-34/85 the correct method used in Soviet documents is T-34-85. Another of the three T-34/85 Red Army WW2 medium tanks was donated to France by Soviet President Brezhnev during his meeting with the French President Giscard d'Estaing for the 30th anniversary of the end of the war. The tank was delivered by Russian General Gretchko in late September 1974. It was exhibited alongside two German WW2 Panther tanks in front of the French Army Museum, Les Invalides in Paris. It was totally new and in factory condition. The tank had not seen action. French Students demonstrating against the Cold War and the nuclear arms race used a Molotov cocktail to set it on fire 3rd December 1974. 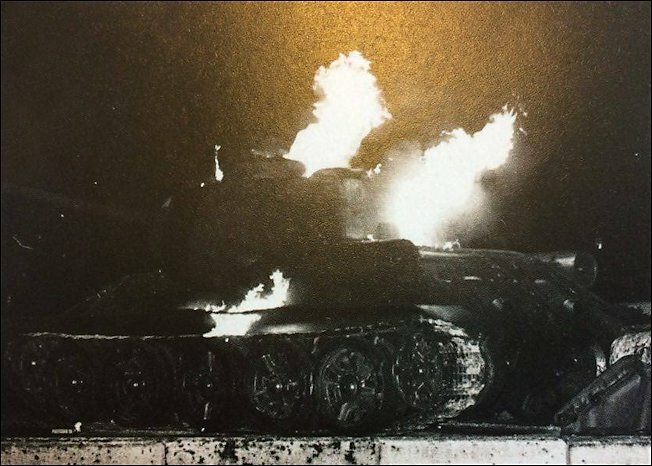 The picture shows the T-34/85 burning on the Streets of Paris. It is ironic that a Red Army tank was destroyed by a Molotov Cocktail. Soviet President Brezhnev was arriving the next day 4th December 1974. French Students demonstrating against the Cold War and the nuclear arms race used a Molotov cocktail to set it on fire. The picture shows the T-34/85 burning on the Streets of Paris. To avoid Russian displeasure it was then decided to quickly bring The T-34/85 back to the safety of the French Tank Museum in Saumur and at the same time transport the two Panther Tanks to the Museum. A convoy of three lorries transported the three tanks across Paris on the night of the 15th October 1975. This operation is conducted at night to avoid any more problems. The Museum did not have enough money to pay for the transportation of the two Panther tanks but because of possible international political embarrassment the French Government accepted to pay the total transportation costs for all three tanks if Saumur agreed to restore the burnt out T-34/85. The tank has a replica barrel, mantlet, driver’s hatch and exhaust pipes. 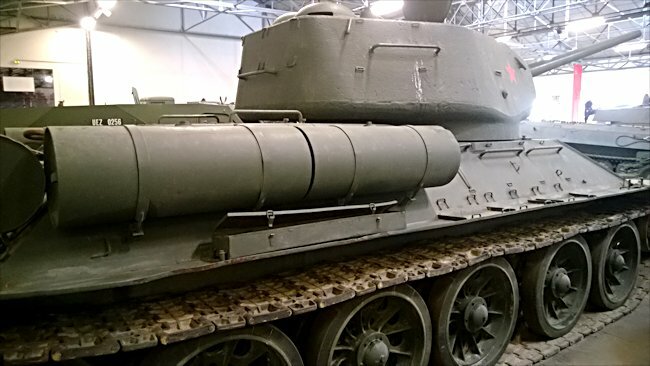 It was found during restoration that the tank was produced at the Krasnoye Sormovo Factory No.112, Sormovsky City District of Nizhny Novgorod (the city was called Gor'ky between 1932 and 1990) Russia. The Russians were not official informed of the damage to their gift. Thanks to Saumur a major international crisis with the USSR was avoided and maybe WWIII? Notice the large amount of hand rails on the outside of the turret and hull on this T-34/85 Soviet Tank. They were intended for use by the Russian infantry who hitched a ride into the battlefield. The Russian advance of August 1944 had managed to encircle and trap the German Army North in an area that ran from Tallinn in Estonia to just west of Riga in Latvia. Thirty German Divisions, 500,000 men faced another Stalingrad. The railway lines that bought military supplies from Germany had been captured. The German Army was running short of ammunition, fuel, food men and armour. Something had to be done about finding a way to break out and retreat to Germany to protect the Fatherland. Panzer Major General Hyazinth Graf (Count) Strachwitz von Gross Zauche und Camminetz looked for a way out near the gulf of Riga where intelligence suggested the Soviet defences were weakest. On the 21st August 1944 he commanded a scouting force of just ten Tiger tanks when he approached the Latvian town of Tucums. It was not far from the gulf of Riga. He spotted fifty Soviet T34/85 tanks lined up in the centre of town. Strachwitz had to get rid of them if an escape route was to be found. He had no artillery, no infantry but he did have a radio that was capable of contacting the Kriegsmarine German Navy flotilla in the Gulf of Riga. He wanted to be able to neutralise as many of the enemy tanks as he could before he attacked with his Tigers. He gave the ships the coordinates of the stationary T-34/85 tanks. It was the very first time that a German Panzer unit had called in Navy artillery support. It was very effective as most of the soviet tanks were destroyed. The German Navy guns fired from 18 miles away. Each ships shell took around a minute to arrive on target. When the bombardment was over Strachwitz and his Tiger tanks charged into the centre of Tucums and destroyed the few remaining enemy tanks that had survived. Strachwitz daring raid had punched a hole in the soviet lines. It opened an escape route for the tanks and soldiers of Army Group North.